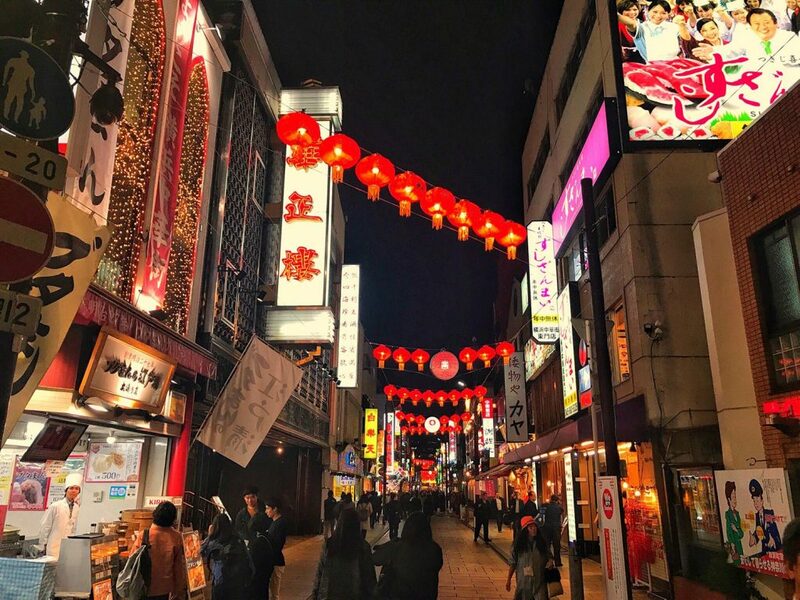 Yokohama Chinatown – When it comes to Tokyo, most people are naturally enamored by the idea of bright city lights in Shinjuku, overwhelmingly dedicated Japanese otakus cosplaying in Harajuku, and the promise of enviable social media photo opportunities at the world famous Shibuya crossing. 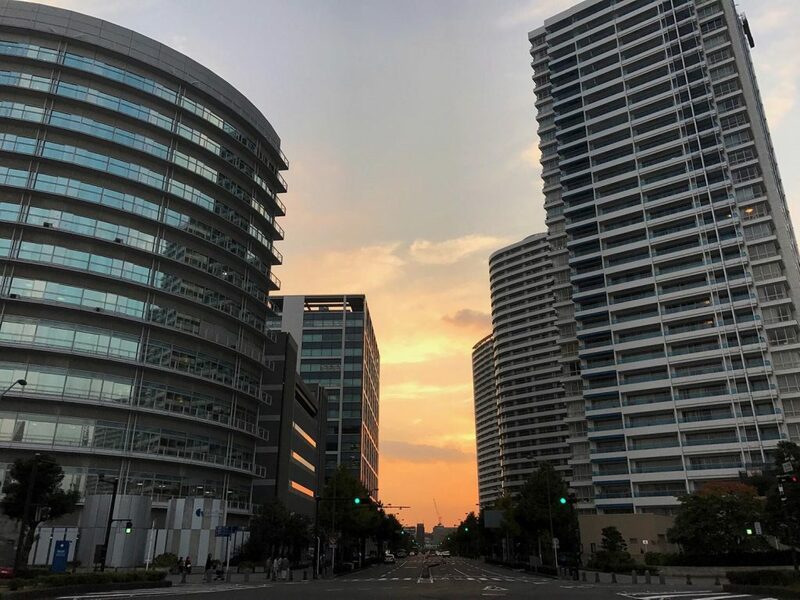 What they don’t realize is that Tokyo’s next door neighbor, Yokohama, offers a (sometimes much needed) respite from the hustle of the concrete jungle that is Japan’s most famous city. Despite both cities being located in different prefectures, you can get to Yokohama from Shinjuku in less than one hour, both by driving and by train (although taking the train would be the cheaper option). Yokohama has established itself as the forward pioneer of what a ‘modern Japan’ could look like. As home to one of largest trading ports in Japan, many foreign businesses have established themselves in and around Yokohama, and thus the city itself is a continuously developing fusion of Japanese culture with international influences. It’s a given, then, that one of the biggest gems in Yokohama, unsurprisingly, is its Chinatown, which is unarguably a force to be reckoned with (it’s the largest Chinatown in Japan!). There are more than 600 restaurants, shops and grocery stores within its vicinity alone. Simply put: there is something for everyone here. During my first ever visit to Yokohama, Chinatown was a must-do on the list. I personally love experiencing established Chinatown’s all over the world. It’s so fascinating to experience how the same, yet different, they are to each other; how Chinese roots have planted themselves and blossomed uniquely over the years. To be frank, its old-school charm won me over instantly. It was a cold Wednesday night in winter when I arrived, and I was excited to ease my hunger pains with some food (dumplings in particular). We had actually spent the day exploring the Minato Mirai area (CosmoWorld, Cup Noodle Museum, Yokohama World Porters), and decided to walk to Chinatown to take in Yokohama views as well as work our appetite for some big meals later. The walk was approximately 25 minutes, and because it was winter, it warmed us up immensely! There are four main entrance gates that lead into the Chinatown. You can take any entrance and eventually, you’ll end up on busy streets that are lined with shopkeepers shouting out their specials, stalls upon stalls of food, gifts, and grocery displays, and menus offering just about every Chinese dish imaginable. First Stop in Yokohama Chinatown: Houtenkaku Xiao Long Bao Dumplings! First stop for us was a dumpling stand called Houtenkaku. We didn’t know it then, but this is actually the most popular soup dumpling stand in this Chinatown. We just lined up because there was a line! At around 5pm, it wasn’t that busy. Its clear glass windows allowed us to see the dumpling master chef in action. Watching them panfry freshly molded dumplings was almost too much. We ended up getting a serving of 6 dumplings with two different fillings. 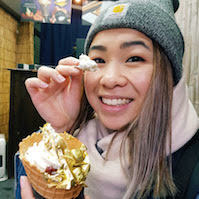 In my haste and hunger, I bit into one of the dumplings without waiting for them to cool down and squirted my friend in the eye with the juices! Some of the soup also escaped the dumpling and dripped down my arm. It wasn’t the best beginning (I still laugh about it to this day), but they were definitely some A-grade dumplings. The next time I come back to this Chinatown, I’d definitely hit this joint up again. A small crowd formed whilst we waited for ours to be freshly made: young families, Chinese tourists, school children in uniform. The front of the store has a great casual vibe – most people bought their dumplings, ate it fresh outside (dumpling connoisseurs would probably wait a few minutes to eat theirs), and dumped their waste in the rubbish bins provided on the side of the building. Next Stop in Yokohama Chinatown: Full Dinner Sets from 800 Yen! Our next dinner was at a Chinese restaurant in one of the many brightly-lit alleys (unfortunately I can’t remember the name, I just remember being lured in by mouth-watering pictures of food). At most restaurants, you will find meal deals that are almost too good to be true. 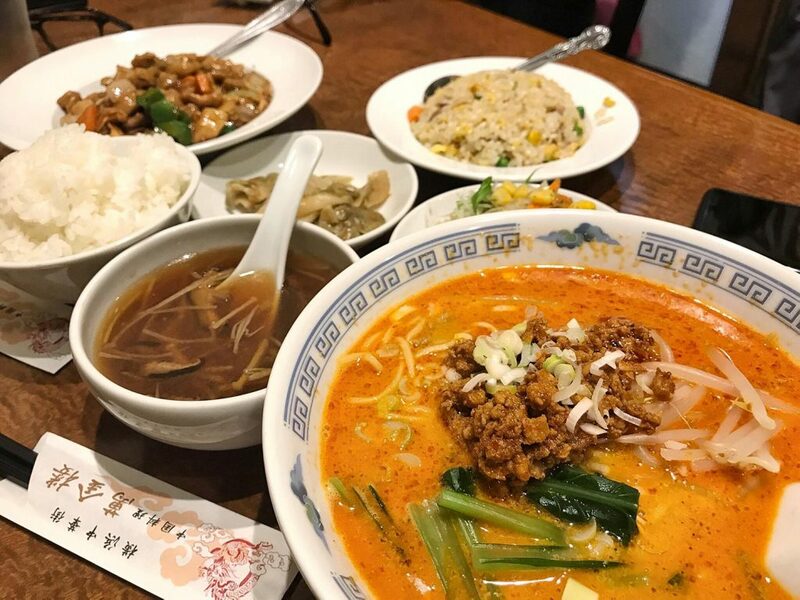 For around 800-850 yen, you can select one main meal (with varieties starting from traditional classics like mapo tofu to fusion fried noodles dishes), and you will receive an array of accompanying side dishes to complement them. What a bargain! Between my two friends and I, we shared 2 sets, and that was enough to fill us. We chose dandan noodles (a Chinese classic) as one of our main dishes and kung pao chicken as the second dish. In addition, we also received a bowl of white rice, a plate of fried rice, a small bowl of hot and sour soup, a mini salad, and a plate of pickled vegetables. For 800 yen each set, you really feel as though you’ve gotten your money’s worth! What Else to Do in Yokohama Chinatown? 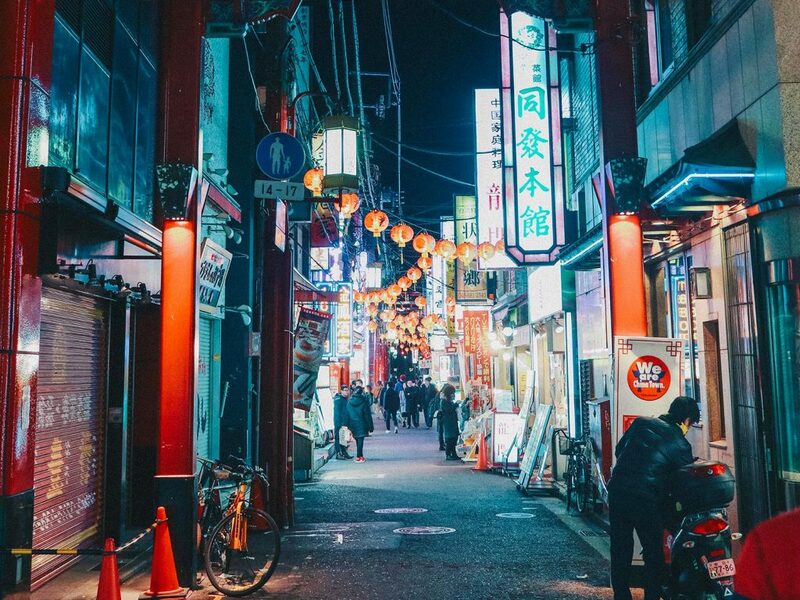 Whilst the main attraction to Chinatown for many would be the fusion Japanese-Chinese cuisine to taste, simply walking around the streets is an experience itself. Brightly light LED lights line the roofs at night, lanterns are strung across buildings in an attempt to replicate the aura of China’s street markets, a heavy mix of Chinese and Japanese language hangs in the air, thrown around by shopkeepers in an attempt to lure customers into their spice-laden restaurants and shops, and the general vibe was very relaxed and casual (but keep in mind, I went during early dinnertime – it most probably has a different vibe during the day!). It’s actually an area that I could get lost in for a few hours by simply exploring. 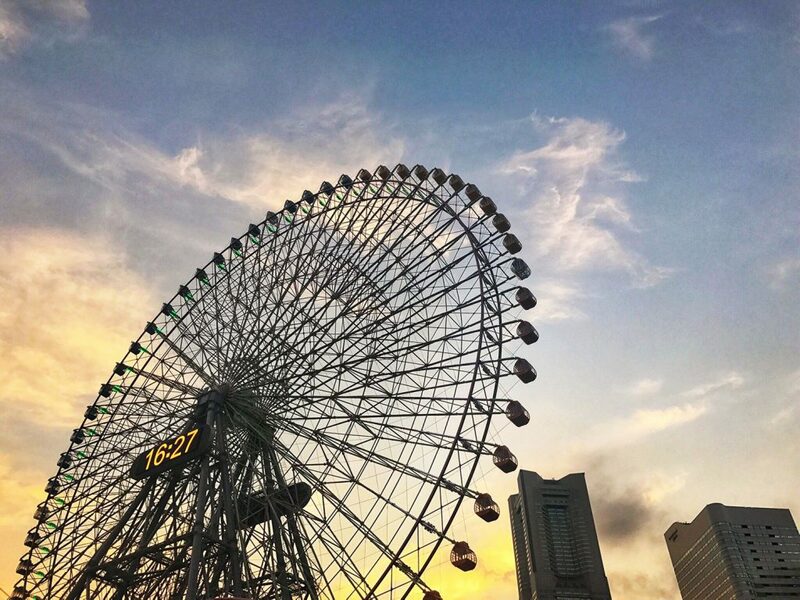 For those who are looking to do a day trip to Yokohama, don’t think, just do. Less than an hour away is a city full of life and culture that cannot be experienced anywhere else. 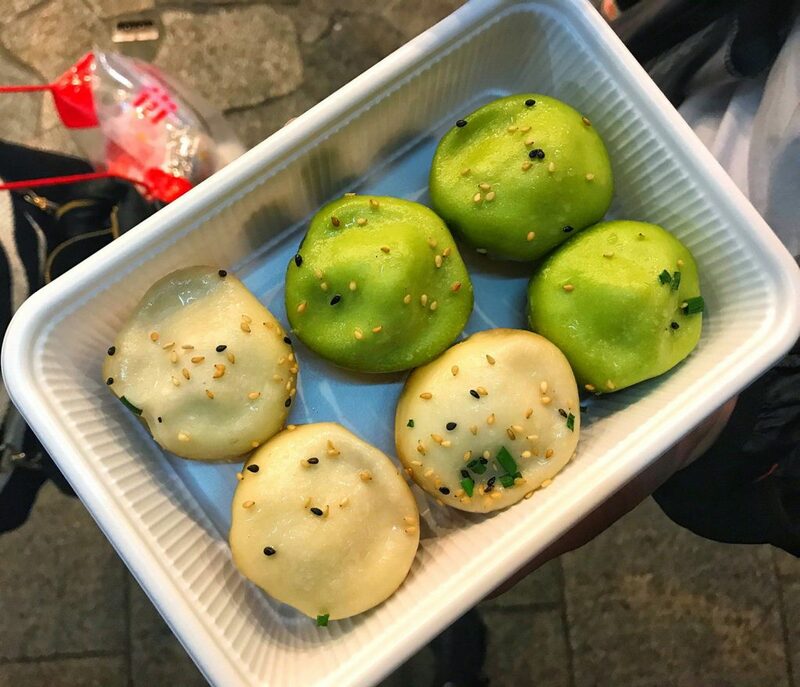 Of course, hit up Chinatown (and keep your appetite healthy) whilst you’re there because a trip to Yokohama would not be complete without it! From Shinjuku/Ikebukuro Station (eastern/western Tokyo): Take the Fukutoshin Line from the station to Motomachi-Chukagai Station (43 – 54 mins). It is a short walk from the station. It costs roughly 650 – 680 yen one-way. From Shinagawa/Ueno (southern/eastern Tokyo): Take the Keihintohoku Line (towards Ofuna) to Ishikawacho Station (36 – 54 mins). It’s around 8 minutes’ walk from the station. It costs roughly 470 – 640 yen one-way. From Yokohama Station: Take the Minatomirai Line to Motomachi Chukagai Station (7 mins). It is a short walk from the station. It costs roughly 210 yen one-way. Driving from Tokyo to Yokohama Chinatown will take roughly 30 mins (note: this is not during peak hour). You will be able to find plenty of coin parking around the area, however, be prepared to pay around 400 – 500 yen per 30 mins during the day (fee may be different depending on time and day). Entering Chinatown itself is free, but it is a good idea to bring cash as most shops and restaurants don’t take card payments. Most shops are open from 10am to 11am, and close around 9pm to 10pm (trading hours vary between shops). Our recommendation would be to avoid visiting on the weekends, as the streets get too crowded to walk comfortably, and you’ll be waiting in line for at least an hour at the more popular joints. Weekdays are a better option, but avoiding the lunch rush hour would be best. 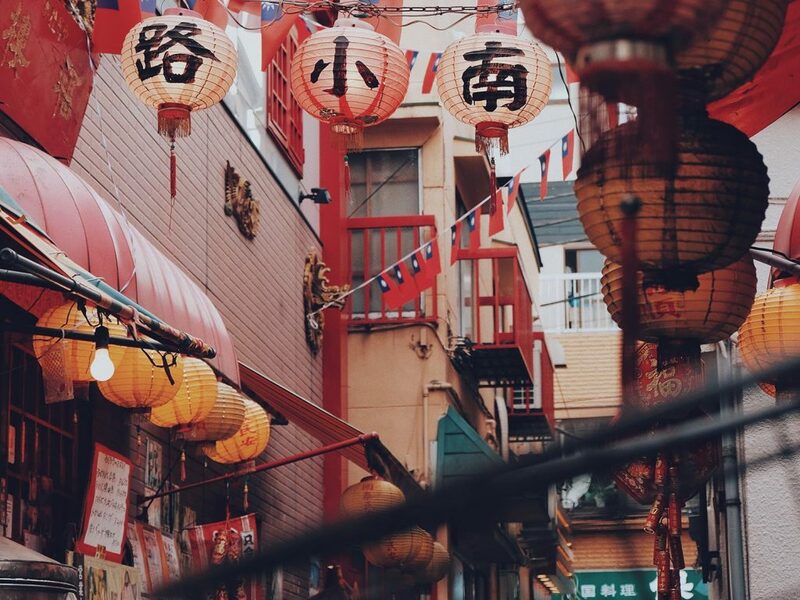 Want more information on Yokohama Chinatown?